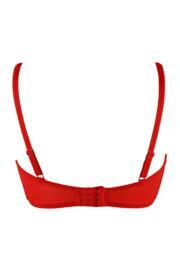 If you are looking for something to add to your underwear drawer then why not try the Ditto Cami underwired bra. With its light padding and hidden wires this bra may become your comfiest addition. With its fully adjustable straps and curved neckline why not wear it to be seen as well. Really comfortable fit and looks lovely on. Lovely bra which looks great with low cut tops. However, the size is a little smaller than other bras of this cup. The underwire isn’t fully attached to the bra in the middle meaning it doesn’t have the standard cups you would expect. It’s a crop top with underwires separately to the main structure that seem to serve no purpose other than to dig in to your chest. This is really cute. It fits well, looks fab and will look great under a low-cut top or dress. Great service, quality, amazing goods. A lovely bra but it seems a bit small.